On February 1st when we move to a new frequency if you are using an antenna to watch TV for free, you have to rescan your TV. Once you rescan, you’ll find all of your favorite shows on the same channels. South Florida PBS’s film-maker series is now accepting submissions for Season 2. This unique program offers our region’s storytellers a platform for broadcast distribution of their finished films. Created by South Florida PBS, the Health Channel? All Health All the Time? is the first TV channel of its kind, offering a uniquely designed concept that connects you with medical and well-being specialists. Trusted. Valued. Essential. Show your support for PBS; visit www.pbs.org/value for more information and to share your story. #ILovePBS. Like WXEL South Florida PBS on Facebook to stay up to date with all the latest news. 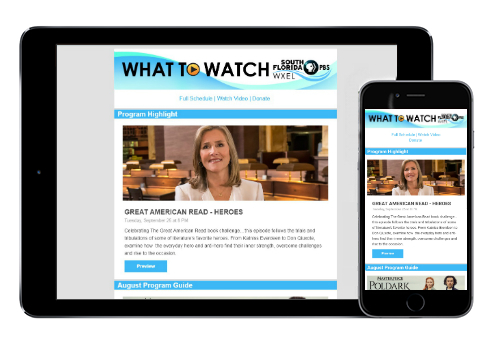 Join our mailing list and you'll receive our weekly "What to Watch" and monthly "Inside South Florida PBS" newsletters that give you a preview of new shows, community events, and station news. You'll also receive invites to exclusive South Florida PBS events and member offers. Click the link below and choose your preferred interests.